Is it possible for a film to be both preposterously stupid and ridiculously entertaining? The answer is yes if Jaume Collet-Serra’s latest collaboration with Liam Neeson counts for anything, another thriller that positions the now 65 year old in the role of action hero. 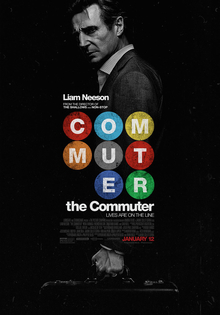 In ‘The Commuter’, Neeson plays Michael MacCauley, a former policeman who now works as an insurance salesman in New York City, going through the same daily routine to travel in from his family home outside the city. We join him just as he finds out he’s being made redundant, and after a brief drink with an old colleague (Patrick Wilson), he boards his train home where he encounters a mysterious women (Vera Farmiga) who draws him into a conspiracy with the temptation of much needed cash. I’m not sure if the commuter experience is different in the states than it is over here in the UK, but ‘The Commuter’ posits it as a communal experience where regular commuters know each other by name and make small talk (maybe we’re just all rude over here with headphones in all the time!). This helps to establish the premise as MacCauley’s task is to identify a train passenger who doesn’t ‘belong’ and he can immediately rule out those passengers he already knows. It’s a silly premise and becomes even sillier when it’s clear the people Farmiga’s character work for have eyes and ears everywhere, yet they’re unable to identify the individual themselves and would prefer to drag a stranger into their conspiracy. That being said, the film does have immense fun with this setup and Neeson has previously established his credentials as the gruff civilian dragged into action against his will. It’s also a step up on ‘Non-Stop’, one of Collet-Serra and Neeson’s previous collaborations with a similar premise. It does get more and more ridiculous but credit where it’s due, the script isn’t predictable and it’s solidly acted and directed with some sharp action sequences. Sometimes you want to watch a film where you can switch your brain off, not think too much about the mechanics of the plot and just let yourself be entertained. ‘The Commuter’ is the perfect film for one of these occasions and I had a blast watching it.